Struggling to understand the difference in research, evidence-based practice and quality improvement? Come “get it straight” with the experts! There will be a question and answer session at the end of the presentation so that your questions can be answered live! Objectives: Differentiate evidence-based practice (EBP), research and quality improvement (QI). 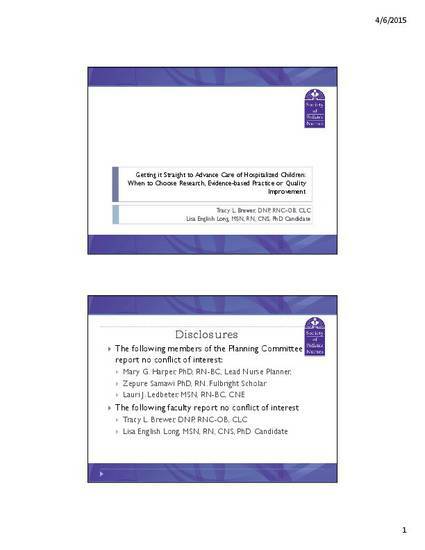 Identify resources to support EBP, research, and QI in the clinical setting. Presented as part of the Society of Pediatric Nurses' Webinar Series, February 10, 2015. The recording can be accessed at http://www.pedsnurses.org/p/bl/et/blogaid=221.